With classic American racing yachts, there’s more than one meaning to the phrase, bring’em back. Any wood boat that’s been out there a while will surely have been “brought back” one time or more through restoration procedures that we can reasonably hope are unreasonably fanatical. There’s also: Bring’em back home. For a while it seemed that all our classic raceboats were off to the Med. Lately, less so. I knew I had to write about this when I heard that Dorade is going up for sale today, and that’s an opportunity. Is there any other boat that so distills the history of American yacht racing in the 20th century? And we know it was Edgar Cato who brought her home. Dorade was ten years in the Med. She’s been four years now back in the USA with Cato, but first her new owner and his agents had to convince the Italian authorities that, yes, she’s more than 75 years old and an artifact to be sure, but not an Italian artifact, so let our boat go, please? And they did. The boat was merely passing through Italy, anyway, outbound from the south of France for the USA, where her new owner would make her a fixture of classics events on the East Coast. 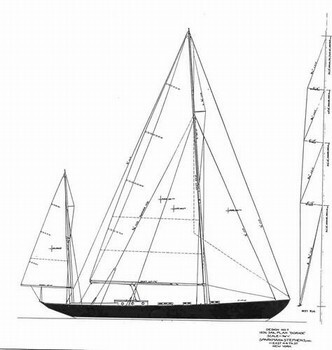 Two years later, Joe Dockery purchased Sonny (S&S 1935; 53 feet) and returned that boat from the Med. Dorade and Sonny have been racing bow to bow pretty much ever since. Skylark too came home from the Med. But you have to love the little stories. 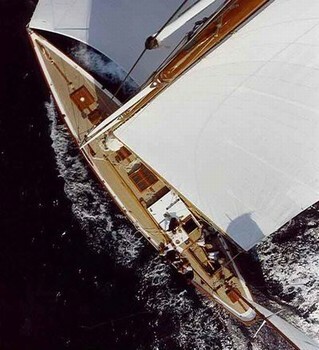 Such as, why is there an Anna, a newly-built 56-footer with the classic looks of Stormy Weather and a modern underbody? Why, son, it’s because when Sam Rowse tried to buy Dorade, and went to France to seal the deal on his accepted offer, the owner somehow got strange feelings and refused to sell. Rowse then commissioned S&S to design an homage to Stormy Weather, leaving Dorade still out there until Cato pried her loose. Giving credit where credit is due: It was a European who years ago recognized the value of Dorade and gave the boat its first deep-down restoration after purchasing her in the USA. That would be Italy’s Giuseppe Gazzoni-Frascara, who had her lovingly rebuilt on the Tuscan coast by Cantierie Navale dell’ Argentario. That yard at the time had restored the Twelve Meter Nyala and would soon restore both Stormy Weather and Sonny. The result is the iteration of Dorade that is now for sale in Portsmouth, Rhode Island for just south of a million dollars. Few are qualified, financially, to own this boat and fewer still are qualified. 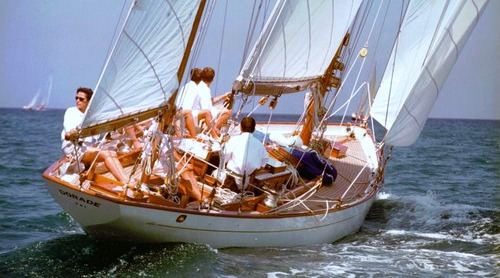 And for those too new to sailing (welcome, you’re going to love it here) to already know the Dorade story—how it launched the career of a young Olin Stephens and put Sparkman & Stephens on the road to becoming the linchpin design firm of its heyday and a continuing force—this is not the place to recount her historic 1931 transatlantic win, or the Fastnet win, or the 1938 Transpac win, but you get the idea that I’m talking about important stuff. There are many sources for more information, including the S&S company web site at sparkmanstephens.com. The recent, deep-down work that Cato commissioned was done at Buzzards Bay Yacht Services. At their web site you can find photos of the work. And if you think you’re qualified, you can find full details of purchase at Paul Buttrose Yachts. If not, it’s only because you’re in there early on Tuesday, ahead of the web editor. Well done.